We moved to the farm and installed underground pipes for water. A couple of spots had freeze proof hydrants. 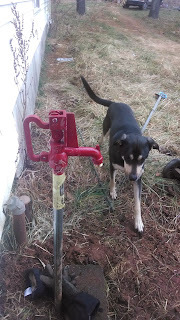 With the pipes buried below the freeze line and the handle on the hydrant flipping open and closed underground all was well. But this year each of the handles developed small cracks. And with each freeze and thaw a little more water seeps in until the entire handle is cracked and leaking. Who knew there are different grades of frost free faucets? Since we need to use ours everyday we need the best we can find. The opening and closing moves the pipe a little each day, so the metal must be able to withstand a lot of wear and tear. Our faucets came from the local hardware store. Yesterday Homer located a plumbing supply house that stocks these outdoor faucets that have replaceable parts. When a component cracks it can be removed and replaced. The entire unit does not have to be removed, just the part. And the plumbing supply house stocks every part. One hydrant is in. One to go. A connection broke at the ground level. Mud and rocks got inside. Homer used the wet/dry vac to get all the crud out before adding this hydrant. Farm engineering.